Cuartito Azul Tango – Anibal Montenegro at Cuartito Azul Zurich! Anibal Montenegro at Cuartito Azul Zurich! Cuartito Azul Tango / Anibal Montenegro at Cuartito Azul Zurich! We are very happy to bring you Anibal Montenegro, who will be teaching group and private lessons with us for two weeks, starting the 10th of October. Aníbal’s first encounter with tango was in 2001, when he started taking classes and going to milongas. He has learned from reconized teachers such as Luciana Valle, Fernando Galera and Vilma Vega, Julio Balmaceda and Corina de la Rosa, Dina Martinez, Valencia Batiuk, Chicho Frumboli and Gustavo Naveira. As to his professional training, it has always included both traditional tango and the most modern techniques in vogue. Thourghout these years, Aníbal has worked with at some of the most prestigious Dance Schools in Buenos Aires such as: Estudio La Esquina, Escuela Argentina de Tango and Tango Brujo. 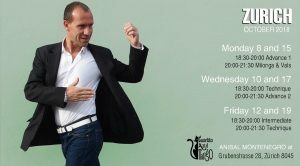 After more than ten years of teaching experience, Aníbal has developed a very deep knowledge of the best approaches to teaching tango, allowing him now to provide clear and well-structured classes, with a dynamic and friendly approach, focusing on technic and adjusting them for each level, from beginners to advanced. His classes have a wonderful combination of content, exercises and fun, and his teaching style is very friendly and approachable. It’s also important to mention that Aníbal gives his classes both in English and Spanish languages.